I walked around Montrose for a little while this morning, November 26. 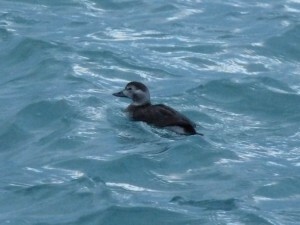 My best find was a female Long-tailed Duck in Lake Michigan near the tower at the southeast corner of the point. I’m guessing this is the same Long-tailed Duck that was seen at Loyola a couple of days ago. Other birds seen at Montrose this a.m. include good numbers of Red-breasted Mergansers, both on the water and migrating south, the continuing Ruddy Duck inside the fishing pier, a small loon that was probably a Red-throated, flyover American Pipit and Snow Bunting, and a lingering Fox Sparrow at the Magic Hedge. This entry was posted in Fall Bird Reports and tagged American Pipit, Long-tailed Duck, Longspurs, Pipts, Ruddy Duck, Snow Bunting, Waterfowl on November 26, 2014 by rhughes. I heard and then saw a Common Redpoll at Montrose this morning, November 21 near the south end of the Magic Hedge. This is my first Common Redpoll of the season, but not the first Common Redpoll OF the season at Montrose, since Al Stokie had one back in late October. In other news, winter ducks have finally (and I guess this is a good thing) arrived at Montrose. I walked out onto the fishing pier and had decent numbers of Common and Red-breasted Mergansers, as well as a few Common Goldeneyes and Buffleheads. Also, a group of Hooded Mergansers, a Redhead, and a Ruddy Duck. I did not see the Red-necked Grebe in the harbor, just Horned Grebes. This entry was posted in Fall Bird Reports and tagged Common Redpoll, Ficnhes, Grebes, Horned Grebe, Ruddy Duck, Waterfowl on November 21, 2014 by rhughes. The Red-necked Grebe was still in Montrose Harbor this morning, November 11. I saw it swimming among the starfloats on the west side of the harbor. A brief walk around the point also yielded one each of Pine Siskin, Purple Finch, Snow Bunting, Lapland Longspur, and Rusty Blackbird. This entry was posted in Fall Bird Reports and tagged Finches, Grebes, Icterids, Lapland Longspur, Longspurs, Pine Siskin, Purple Finch, Red-necked Grebe, Rusty Blackbird, Snow Bunting on November 11, 2014 by rhughes. I spent about an hour at Montrose this morning, November 9, mostly looking at the lake from the fishing pier. Lake Michigan was nice and calm and the visibility was excellent but there wasn’t much out there, either on the water or flying by. I did have a first cycle Great Black-backed Gull, probably one of Steve Spitzer’s birds from Loyola, a Common Merganser, my first of the season, and a lone Snow Bunting. Walking back I found a first cycle Lesser Black-backed Gull on the beach, again probably a Steve bird from Loyola. I didn’t look for the Red-necked Grebe but others said it was still in the harbor. This entry was posted in Fall Bird Reports and tagged Great Black-backed Gull, Gulls, Lesser Black-backed Gull, Longspurs, Snow Bunting on November 9, 2014 by rhughes. 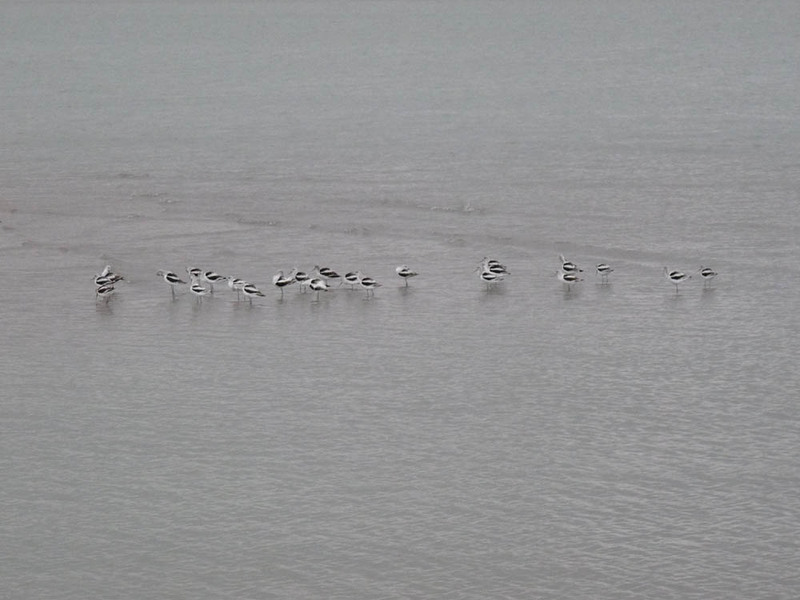 Twenty four American Avocets were at the east end of Montrose Beach early this morning, November 4. 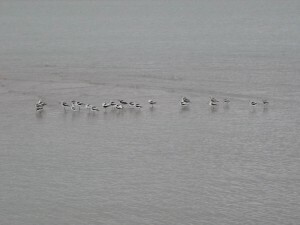 The birds were still there when I left at 7 but apparently a Peregrine Falcon came along and scared all but one of them away, and from what I heard that one avocet is lucky to be alive. This is one of the largest groups of American Avocets I’ve seen at Montrose and by far the largest group this late in the year. This entry was posted in Fall Bird Reports and tagged American Avocet, Shorebirds on November 4, 2014 by rhughes. 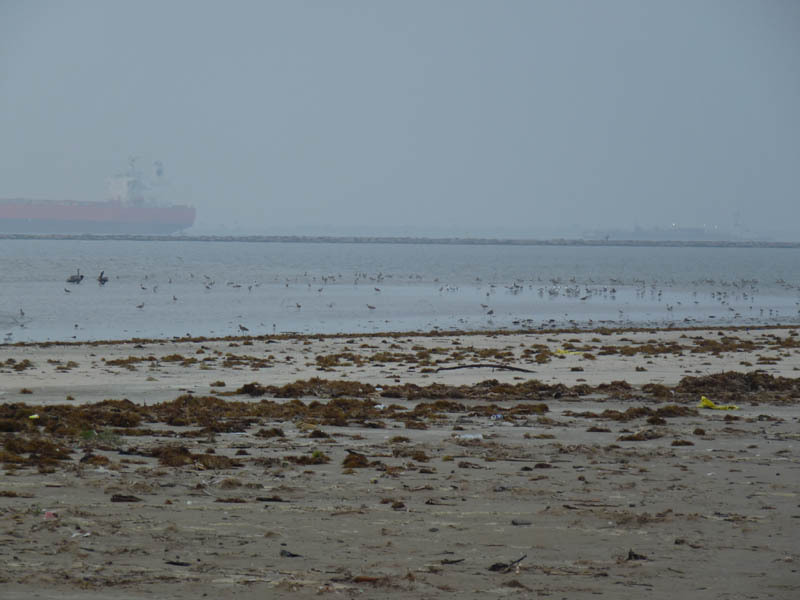 I spent April 28 and 29 birding the Bolivar Peninsula and Anahuac National Wildlife Refuge on the Upper Texas Coast. The passerine migration on the UTC was almost non-existent when I was there, so except for a very brief visit to Boy Scout Woods I skipped High Island and spent most of my time looking for shorebirds, terns, and other waterbirds, which were in abundance. 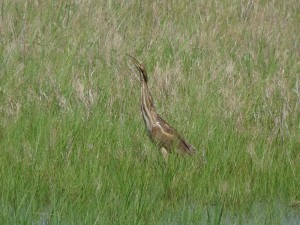 The Houston Audubon Society Bolivar Flats Shorebird Sanctuary is an amazing place in spring. Every time I bird there I’m floored by the number and variety of shorebirds and terns that use the place, and it was no different this time. As I walked down the beach on my first morning I saw what looked like gnats on the shoreline in the distance. When I looked with my bins I could see that the gnats were actually shorebirds. Thousands of them. Abundanza. Hundreds of American Avocets were working the beach, along with numbers of Eastern and Western Willets, Short-billed Dowitchers, Black-bellied and Semipalmated Plovers, Ruddy Turnstones, and Sanderlings. I also had a few Red Knots, Marbled Godwits, Western, White-rumped, and Baird’s Sandpipers, and Wilson’s and Piping Plovers. I even had a flock of Wilson’s Phalaropes fly in and land in a puddle on the beach. Tern numbers and variety were impressive too and I had all 9 of the regularly occurring species, with Royal, Sandwich, Black, and Least being most common. It’s not just the number of birds that makes Bolivar Flats so impressive but also how busy and bustling it seems. I also checked Rollover Pass and Fort Travis Seashore Park. 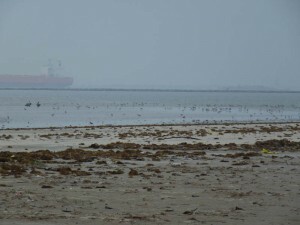 Rollover Pass is a man-made channel that cuts through the Bolivar Peninsula and connects the Gulf of Mexico to Galveston Bay. The islands, sandbars, and spits in Galveston Bay at Rollover held lots of resting terns, including Royal, Sandwich, and Least, and good numbers of Black Skimmers. Shorebirds weren’t abundant but I did have a couple American Oystercatchers and Wilson’s Plovers. Fort Travis Seashore Park wasn’t on my itinerary but I noticed on the sightings board at Boy Scout Woods that Buff-breasted Sandpipers were seen there recently, so I decided to have a look. Fort Travis is at the tip of the Bolivar Peninsula and is mostly open and grass covered, which is why Buff-breasteds like it I guess. I had a flock of 10 Buff-breasteds walking around on the grass, almost in front of me at one point, my only Buffies of the trip. When I was done with Bolivar in the morning I headed over to Anahuac National Wildlife Refuge, which is just up the road. Anahuac is a joy to bird, and some of the easiest birding you can do (actually, the whole Upper Texas Coast is like this). 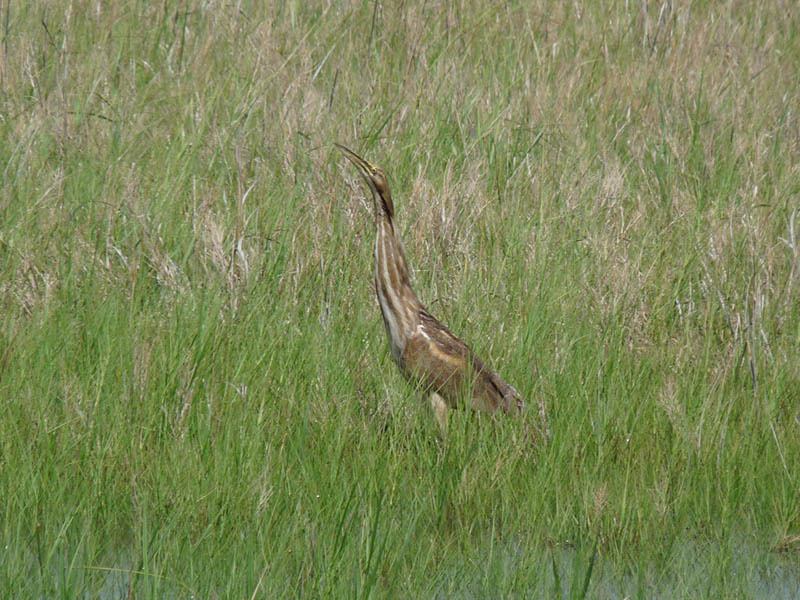 There’s no slogging through mud or fighting through brush to see birds at Anahuac. A series of easy to drive gravel roads traverse the refuge, offering excellent views of the marshes and impoundments. Most of the time you don’t even have to get out of your car to see the birds. Anahuac was excellent for herons and egrets, and I had multiple Yellow-crowned Night-Herons and American and Least Bitterns, in addition to the more common species. I also had Black-bellied and Fulvous Whistling-Ducks, my only Fulvous Whistling-Ducks of the trip, and King and Clapper Rails. Shorebirds were good too, with numbers of Whimbrels, Stilt Sandpipers, and Long-billed Dowitchers, a couple Hudsonian Godwits, and a bonus Ruff. Anahuac isn’t known for its passerines but at least there were lots of Boat-tailed Grackles to look at and study, and I had my only Seaside Sparrows of the trip in a saltmarsh near the Gulf. Between Bolivar and Anahuac I ended up with 34 species of shorebirds over the 2 days I was on the Upper Texas Coast. The only regularly occurring shorebirds I missed were Upland Sandpiper and Snowy Plover, both of which were probably around and I just missed them. In contrast to the shorebirds I had exactly 1 species of warbler, Common Yellowthroat, the breeding birds at Anahuac. I don’t think I’ve ever done well with passerines on the Upper Texas Coast but the shorebirds, terns, herons, egrets, and other waterbirds always come through. When I was planning the trip I looked at my map for a place I could bird for a couple hours on my way back to Chicago, someplace in Louisiana or Mississippi that was close to Interstate 10, the highway that took me through Texas and that would take me part of the way home. I saw a green blob on the map called Atchafalaya National Wildlife Refuge in southern Louisiana near Baton Rouge that looked interesting. I did a little research and found out that Atchafalaya had nesting Swallow-tailed and Mississippi Kites and Swainson’s Warblers, which was enough for me. Twist my arm. As soon as I entered the refuge I noticed large flocks of White Ibises wheeling around overhead, along with smaller numbers of Anhingas and Little Blue Herons. Songbirds were going strong with lots of Prothonotary and Hooded Warblers, White-eyed and Red-eyed Vireos, Blue-gray Gnatcatchers, and Indigo Buntings. I also had several Painted Buntings and Summer Tanagers. After a little while I started seeing Mississippi Kites and eventually one Swallow-tailed Kite too. I did hear and then see a Swainson’s Warbler but it took a while and I had to play a recording to see it (please, no lectures). The checklist for the refuge claims that Swainson’s Warblers are common but I have a hard time believing they’re common anywhere. At least I saw one. I wonder what the Cajuns thought when they saw me, iPad in hand with white cross trainers, walk off into the woods to look for the Swainson’s. The biggest surprise was an Inca Dove, a bird that isn’t even on the refuge checklist. After Atchafalaya I started back home. I didn’t do much birding on the way, except for what I could see while driving, which wasn’t much. After 13 states, 3700 miles driven, and 332 species of birds I arrived back in Chicago on the evening of May 1, just in time for rush hour and a snarling traffic jam. This entry was posted in Non-Montrose Birding on November 3, 2014 by rhughes.